My mum is US born and bred, although she’s lived in the UK for over 40 years now. Accordingly cookies were a big (although not frequent) part of growing up for me. They’re also my first memories of cooking. helping mum cream the butter and sugar, stealthily dipping my finger into the sweet, buttery mixture when I thought she wasn’t looking. Carefully pouring in oats and raisins and stirring with all the concentration of a child that knows they’re doing something very important indeed. It’s been a while since I baked cookies, not least because I try to be healthy most of the time, and anything biscuit-like in the house tends to be gobbled up in one or two sittings as I turn into a slightly bug-eyed cookie monster. Still, I like to think I have some self discipline now I’m in my thirties. Having not made them for a while I consulted a few recipes, mainly one from Hugh Fearnley-Whittingstall’s River Cottage Everyday cookbook. That one called for the butter to be melted before adding the sugar. But if I did that (my inner cookie monster muttered) how would i be able to dip my finger into the mixture? So, remembering my childhood cookie making, I added an extra five grams of butter and sugar and creamed them together. I think I only took 10 grams worth of the mixture… It didn’t seem to change the end result which was a smooth, more biscuit than cookie-like disc of crunchy goodness. It wasn’t oaty or gooey enough for me so if I did it again I would probably double the quantity of oats and maybe add a bit more honey. I’d also substitute the caster sugar for more brown sugar to give a slightly deeper sweetness. First heat the oven up to 190o, then cream the butter and sugar together, adding an extra 5g of each if you – like me – know you’re not going to be able to resist dipping a finger in. Sometimes I don’t know why I bother cooking the cookie dough, it taste so good in its raw form. Beat in the egg using a wooden spoon. Then sieve the flour, baking powder and cinnamon into the bowl and stir all the ingredients together until you get a smooth roux-like paste. Add the honey and combine it with the rest of the ingredients. Finally stir in the nuts, raisins and oats. This is a good point to ‘test’ the mixture again. Just to make sure you have got the right balance of ingredients of course. If you’re at all unsure, do try it again. Cover a baking sheet with greaseproof paper. Take dessert spoons of the cookie dough and splodge them on to the paper a good distance apart because they will spread. I always underestimate this gap but it doesn’t really matter too much as they’re easily separated after cooking and cooling. Cook for 8 mins, have a look to see if they’re done and leave them in for a minute or two longer if you think they need more time. But no more than this because they turn from under to over cooked very quickly. Take them out of the oven and leave to rest for a minute or two before lifting the paper, complete with cookies, off the sheet and on to a wire rack to cool. Don’t try and remove the cookies too quickly because they won’t have set yet. Leave them a good ten minutes or so, if you can resist. Cookies were a big AND frequent part of my childhood! Creaming the butter and sugar together is way better than the melting method, because you wind up with a cookie that’s a bit soft inside and crispy outside! That’s a good point Erika, i had never thought about that, but you are quite right about the soft/crispy result. 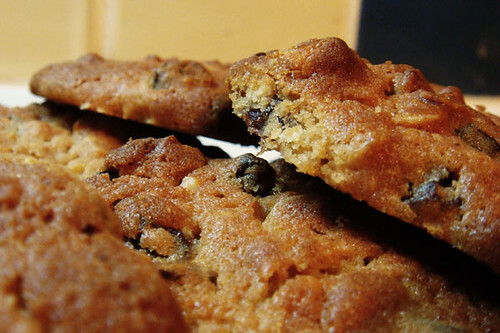 Your cookies sound and look very delicious – I just love anything with cinnamon and nuts in it basically. It is funny how Americans are so crazy about cinnamon but not the Brits – whenever I go to America I stock up on cinnamon tic tacs, chewing gum, sweets of every shape and form! Thanks London Foodie They’re pretty much gone after a midnight raid on the cookie box (I still haven’t grown up when it comes to cookies)… I know what you mean about cinnamon. My mum always used to make Cinnamon toast which none of my friends had ever heard of. Just a piece of buttered toast with a teaspoon of cinnamon and a teaspoon of brown sugar sprinkled over the top and grilled. So good. Could not detect a feed for this URL. Blog posts and update time will not be shown. Add URL anyway? Do you know if any other “Blogger” user had the same problem? I have had a few problems with the blog being live – can you try this one: http://www.thegrubworm.com/feed/ and let me know if it works for you? As far as i know others haven’t had the same problem, but i don’t know for sure.